Published: Aug 21, 2017 · Modified: Apr 12, 2019 · By Jen Sobjack · This post may contain affiliate links. I can never pass up an Easy Banana Cake recipe. One bowl and a mixer are all you need to make this decadent cake. 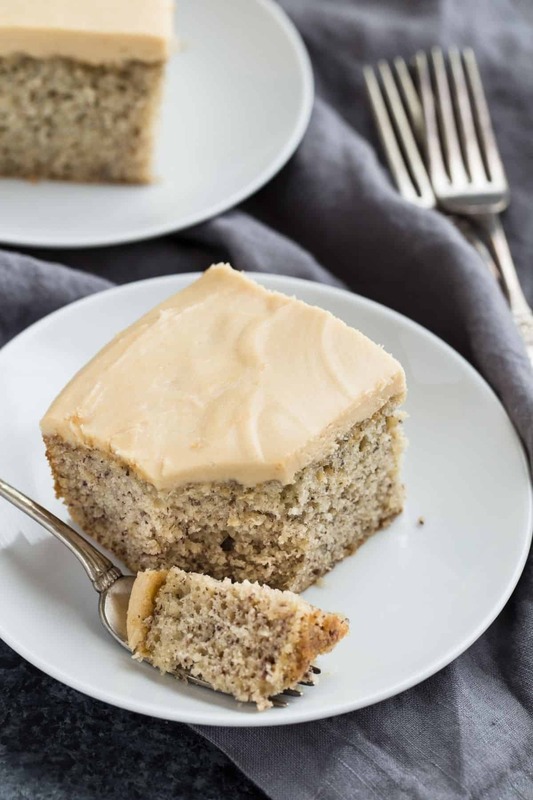 This moist cake will become your absolute favorite banana recipe. Slather brown sugar frosting over the top and you’ve got yourself the ultimate treat. 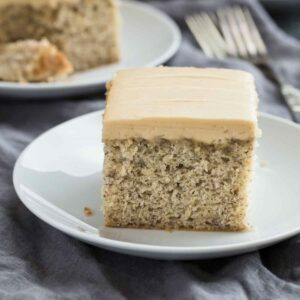 If you like banana desserts, you will love the flavorful and rich cake that’s perfect for your next dinner party. Everyone will rave about how delicious it is. I adore baking with banana. It’s by far my favorite fruit and makes all the baked goods super moist. There is no shortage of banana recipes on the blog. If you type banana in the search bar, you’ll see every glorious recipe that uses this delicious fruit. Why must bananas be so darn good?! Banana zucchini muffins, banana pudding cupcakes, banoffee pie, and banana Nutella cupcakes are just a few of my favorites. The cupcakes are so good, in fact, I thought I’d make a banana cake as well. This cake is so moist. And the brown sugar frosting, OH MY HEAVENS, it’s delightful. I love the caramel-y flavor of the frosting. It complements the cake so well. I promise this is the butteriest, richest, and most tender banana cake you’ll ever try. Not to mention, it’s super flavorful. If you like banana bread, you’ll love this cake. It resembles banana bread in a sense but it isn’t quite as dense. It’s soft but not crumbly. The recipe is made entirely from scratch and it starts with 3 extra ripe bananas. The spottier the skin, the sweeter the banana. And sweet bananas are a must for a good banana cake. I like to puree the bananas in a food processor so they are free of lumps. Lumps are good for bread but I don’t think cake should have lumps of banana in it. It’s totally up to you though. If you want chunky banana cake, simply mash the bananas with a fork. Typically I make my banana cupcakes with all white sugar. But, since I’m adding brown sugar frosting to the top of this cake, I decided to use both white and brown sugar in the cake batter. Honestly, that was the best decision I could make. I mixed everything together in one bowl so cleanup was a breeze. I creamed the butter and sugars, then added the eggs, banana, vanilla, and buttermilk. I sifted in the flour, salt, and baking powder. I should mention that we’re using cake flour, not all-purpose. This yielded the best result when testing the recipe. Cake flour is finer than all-purpose and this is what gave the cake it’s tender yet tight crumb. Buttermilk is, of course, a necessity. It’s what makes the cake supremely moist. If you don’t have buttermilk on hand, you can make it by adding one tablespoon of lemon juice to 1 and 1/2 cups of regular milk. You can also use vinegar instead of lemon juice but I think vinegar has a stronger flavor and I can always taste it. This frosting is absolutely amazing. 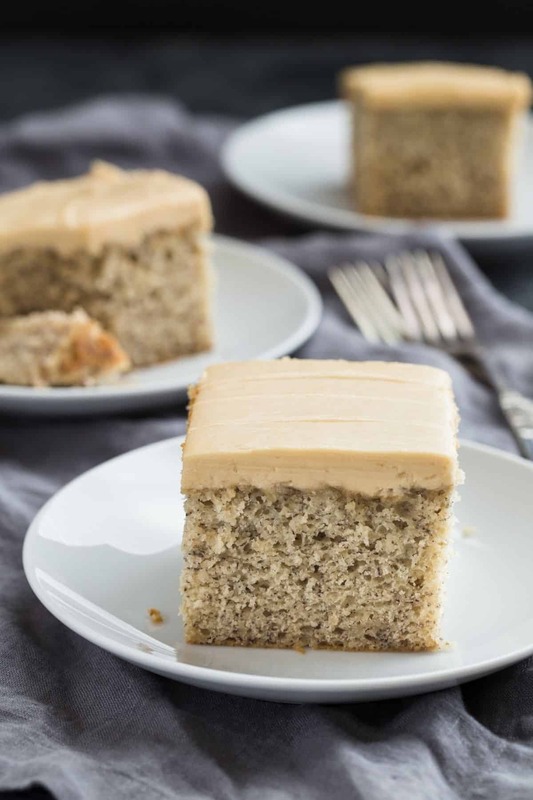 I’ve never had brown sugar frosting until now and I’m so glad I decided to make it. I adapted the recipe from the Cupcake Project. It starts by heating butter until melted, then brown sugar and heavy cream are added. You want to let it sit at a low boil until the sugar is fully dissolved. If you rush this process the frosting will be gritty. It’s very similar to making a caramel sauce. Once the sugar has fully dissolved, transfer the mixture to the bowl of a stand mixer. Attach the whisk attachment and mix on low speed until the mixture has cooled to room temperature. Gradually sift in powdered sugar and a couple more tablespoons of heavy cream until the frosting reaches a spreadable consistency. 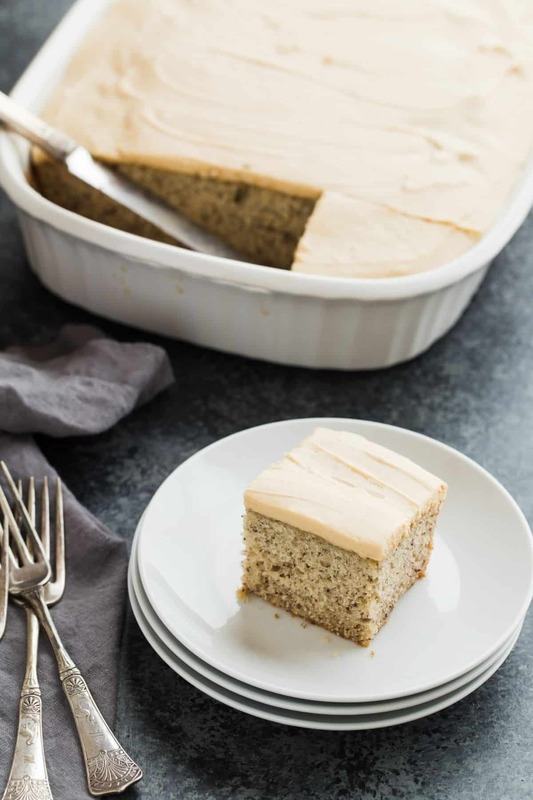 Spread the frosting all over the top of the cooled cake and immerse yourself in the most ultimate easy banana cake recipe. Preheat the oven to 275°F. Lightly grease and flour a 9×13-inch ceramic pan; set aside. In a large bowl, combine the butter and both sugars; beat on medium speed until light and fluffy. Add the eggs one at a time; beat well after each addition. Beat in the vanilla extract followed by the pureed banana. Add the flour, baking soda, and salt to a sifter and sift half into the banana mixture. Mix on low speed just until incorporated. Add the buttermilk and mix until combined. Sift in the remaining flour and mix just until moistened. Do not over mix. Spread batter into the prepared pan. Bake for 45-55 minutes or until a toothpick inserted into the center comes out clean. Bake times can vary so watch closely. Cool completely on a wire rack. Melt the butter in a small saucepan over medium heat. Once melted, add the brown sugar and heavy cream. Bring to a low boil and let bubble for about 3 minutes, whisking constantly, until sugar is fully dissolved. Remove from heat, pour into a bowl of a stand mixer fitted with a whisk attachment. Turn the mixer on low and beat until the mixture reaches room temperature. Gradually beat in confectioners’ sugar and 2-3 tablespoons of heavy cream until the frosting reaches a spreadable consistency. Spread over the cooled cake and refrigerate for 30 minutes before serving. 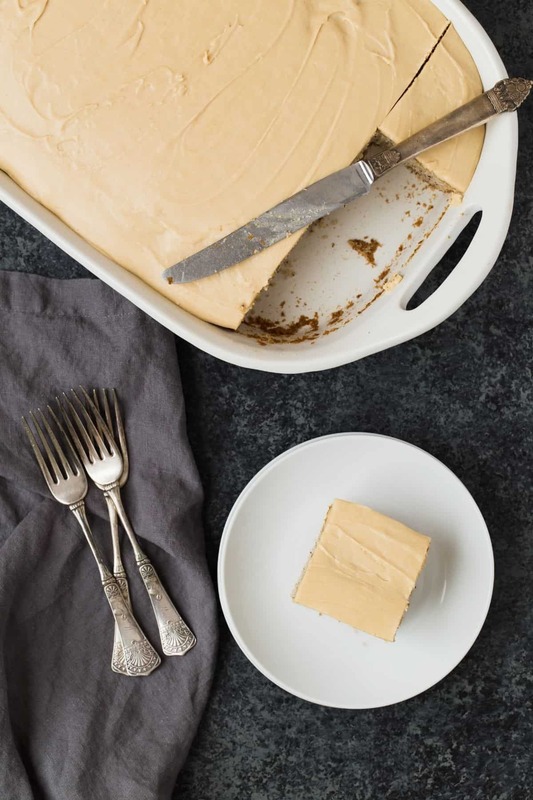 Tightly cover the unfrosted cake and refrigerate for up to 2 days or freeze for up to 3 months. Thaw overnight in the refrigerator and bring to room temperature before frosting. Frosted cake can be covered tightly and stored in the freezer for up to 3 months. Thaw overnight in the refrigerator and bring to room temperature before serving. It’s best to puree the banana in a food processor. You can mash the banana with a fork but keep in mind this will leave chunks of banana through the cake. The 275°F baking temperature is key to keeping the cake moist. However, the bake times can vary greatly. Check the doneness of the cake by sticking a wooden skewer or toothpick into the center of the cake. If wet batter comes out on the toothpick, continue baking until the toothpick comes out with only a few moist crumbs. Depending on the pan you use and your oven, the cake may need up to an additional 30-40 minutes. The type of pan you use will have an effect on bake time. I used a ceramic pan which is much like glass; it conducts heat very well. This means the cake will bake faster. If you use a metal pan, the cake will need additional bake time. I made this today and definitely yummy! I did leave out the powdered sugar in the icing as I thought the brown sugar was enough and didn’t want it overly sweet. Also, I would try cooking this at a higher temperature as after an hour, my cake was still liquid in the middle. Try 300 or 325 and cut down the time a little. Still a great recipe with a few tweeks! Wouldn’t the cake be too sweet with that much sugar in the icing? It really depends on your taste. But the frosting is no different than caramel frosting. Caramel frosting is nothing more than caramel (made from sugar) added to buttercream (made from butter and confectioners’ sugar.) If you’d like, you can leave it off. Wow – this cakes looks amazing Jen. I think I am going to try making it this weekend. I really like your banana cupcakes w/ nutella frosting, so I bet this is going to be a winner too. Wow, this brown sugar frosting looks amazing! I’m definitely going to give it a try soon.